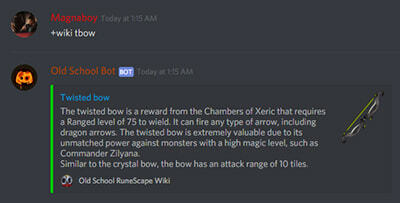 Used in the official Old School RuneScape discord server, along with almost every OSRS streamer/clan discord. Old School Bot is 100% free and 100% open source. Check the stats of any account without leaving discord! Get tweets from all the OSRS Jmods sent to your discord channel! Simulate killing any boss or monster in the game with a message! Too unlucky to get real pets ingame? Get some virtual pets with the bot! See exactly how long it would take for you to get any pet! Get quick information on any quest! Quickly find any page from the wiki! +clues Shows the Clue Highscores of an account. +combat cb Shows your Combat level. +dmm Shows the stats of a DMM account. +dms seasonal, sdmm Shows the stats of a Seasonal Deadman account. +hcim hc Shows the stats of a HCIM account. +ironman iron, im Shows the stats of an Ironman account. +lvl Shows the level of a single stat, and the XP remaining. +pvp lms, bh Shows the BH & LMS scores of an account. 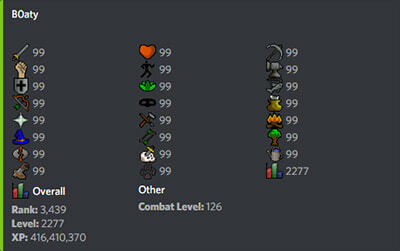 +uim Shows the stats of a UIM account. +xp Shows your XP in all skills. +xpto99 Shows how much XP you have left until 99 in all skills. +ash Random Mod Ash gif. +ayiza Shows Mod Ayiza giving a presentation with a message. +b2bpet Rolls a singular pet until you get it twice in a row. +defender See how long it takes you to get a Dragon Defender. +dice Simulates dice rolls from Runescape. +duel Simulates dueling another player. +fakepm Fake a private message from someone. +fakescythe Get yourself a Scythe of Vitur! +kieren Shows Mod Kieren holding a piece of paper with a message. +kill Simulate killing bosses (shows only rare drops). +markov Markov chain generated from lots of runescape text. +petroll Rolls a chance at getting every Pet at once. +poll Creates a simple reaction poll for people to vote on. +streamers streams Shows the current top 5 RuneScape streamers on Twitch. +trivia t Sends a OSRS related trivia question. +buylimit limit Check the buy limit of an item. +clients Shows all the clients you can play OSRS on. +forums forum Shows the link for the official OSRS forum. +hiscores hs Shows the link for the official OSRS hiscores. +map worldmap Shows the link for the official OSRS map. +mobile Shows the link for the official OSRS mobile app. +news Shows the latest OSRS News Post. +petrate Shows the rates of getting skilling pets at certain levels. +polls Shows the link for the OSRS Polls. +players Shows how many people are playing OSRS. +price Looks up the price of an item using the OSBuddy API. +security Shows some information on securing your runescape account. +support Shows some support links for RuneScape. +tob Shows the Theatre of Blood records. +wiki w Search the OSRS Wikipedia for an article. +world Returns information on a OSRS World. +youtubers yt Shows the links for some OSRS youtubers. +ashtweets Receive every tweet from God Ash in your discord channel!. +autoupdate Automatically update your connected (+setrsn) account on CML every hour. 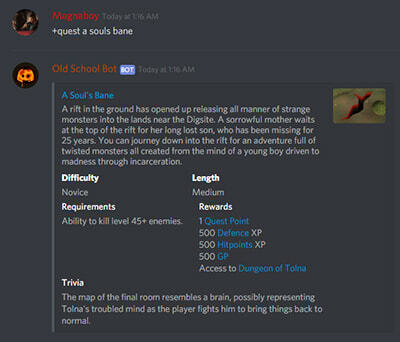 +cmd Enable and Disable certain bot commands in your guild. Admins only. +hcimdeaths Enables/disables HCIM Death Tweets from @HCIM Deaths on Twitter. +jmodcomments Enables/disables the function which sends comments/posts from Jmods on reddit. +petmessages Enables/disables Pet Messages, which rolls a chance at a pet on every message in a channel. +prefix Change the command prefix the bot uses in your server. +setrsn Set your RuneScape Username, used for other commands. +streamertweets Enables/disables the Streamer Tweets function which sends tweets from OSRS Streamers. +tweets Enables/disables the JMod Tweets function which sends tweets from OSRS JMods. +73 Enables/disables, reacts with 😂 everytime somebody says '73'. +twitchnotifications tn Enables/disables the Twitch Notifications function which sends tweets from OSRS Streamers. +current Shows the current records. +lastcheck Checks when a CML Account was last updated. +prevname Checks what the previous name of a player was. +records CML Records for an account, in a period of day, week or month. +track Tracks gains on an account. +update Update a CML profile. +love Find out your love rating with someone! +mypets View the virtual pets you have. +roll Roll a random number between 1-100. +randquote Returns a random message from someone in the channel. +urban Searches the Urban Dictionary library for a definition to the search term. +biggify Makes a big version of an image. +emotes emoteservers Shows all the emote servers that the bot uses. +followage Shows the followage of a given user from a given twitch channel. +github Shows the Github link. +help commands Get a list of commands for the bot. +info Displays information about the bot. +invite Sends the invite link for the bot. +leaderboard Shows the people with the most virtual GP. +pay Send virtual GP to people (not real GP). +server Get information on a mentioned user. +servers servers, communities, community Shows some community servers related to OSRS. +vote Displays the voting link for the bot. +user Get information on a mentioned user.